Tonight we’re on TV – our hardy band of six adventurers take to the small screen for the first time after a year where they pushed outside their comfort zone and took on a whole heap of challenges that they never thought possible. Get Off The Couch! follows six people as they seek to change their lives and take on active challenges that they never thought possible. This series captures the triumph of the human spirit through determination and the desire to better oneself by capturing the personal stories, achievements, and courage of these six ordinary people doing extraordinary things. Get Off The Couch – by Athena Media for Setanta Sports is made with the support of the Broadcasting Authority of Ireland’s Sound & Vision scheme. The six part series is free to air on Setanta Ireland from October 24th 2013 at 10:05pm. Fiona Said ‘Attack The Water’…. 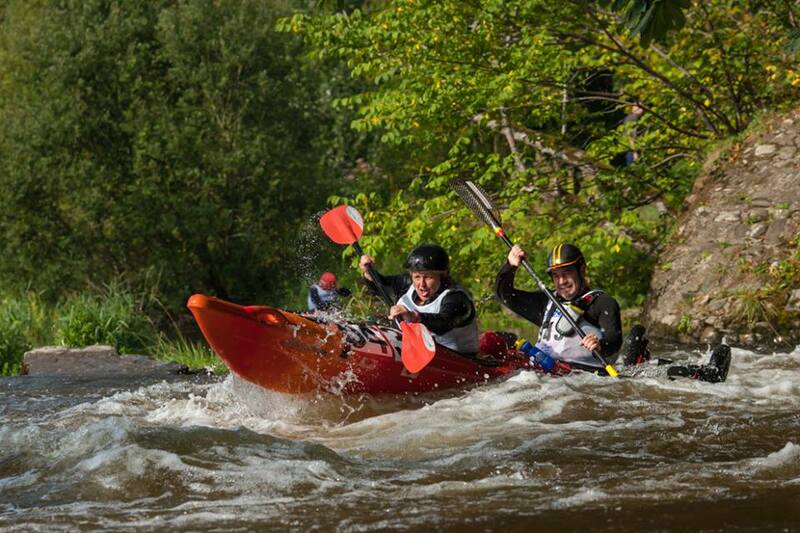 When Kayak Champ Kipper Maguire challenged me to do the Liffey Descent with him for LauraLynn childrens’ hospice, I said I would – as long as I wasn’t just a passenger. I didn’t just want to be the radio person sitting in the spare seat. Little did I realise what I was letting myself in for, but deal sealed the training began – and the help and support I got was amazing. 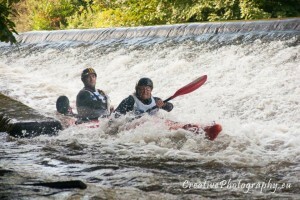 I learned new skills with the Wild Water Kayak Club on the Strawberry Beds, paddled against the tide down river at the Jeanie Johnson with Donnchadh McCobb’s City Kayaking, ran boat cover for my Eastern Bay Swimming Club buddies, and trained with Kipper himself at his base at Rafting.ie at Palmerstown. All summer I paddled and built up distance on the water, and built up strength in the gym. 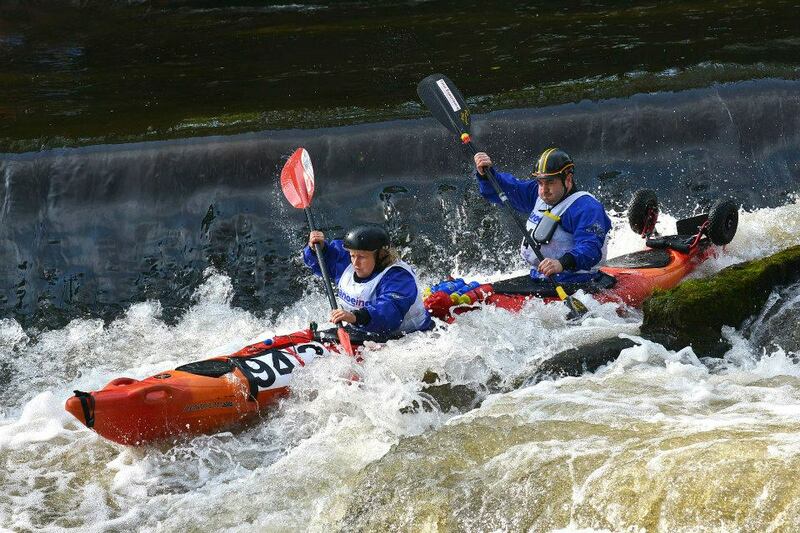 But the one thing I hadn’t expected was my complete terror when it came to going over weirs – a bit of a problem when the Liffey Descent involved 10 of them over a 28k course with millions of tons of water flooding them to the hilt. 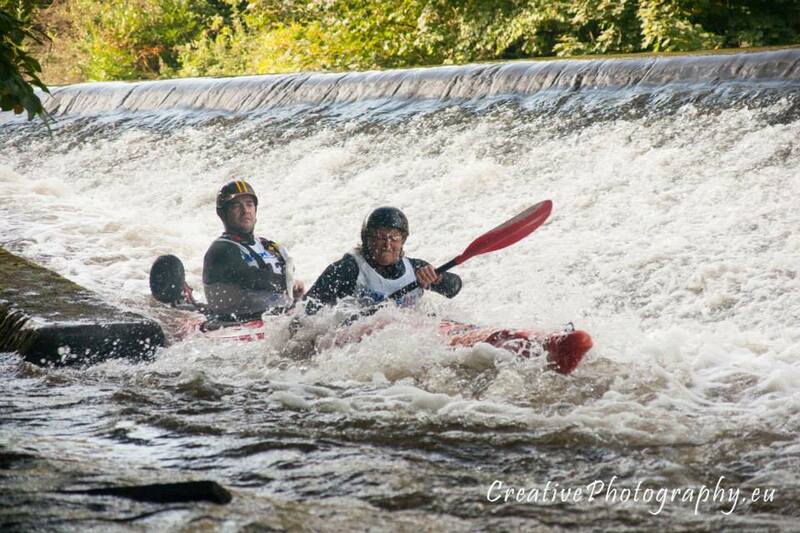 A river trip with Dave Mason and my WWKC paddlers went some way towards getting me over my fears, and Dave even went as far as walking me down Palmerstown Weir to show me there were no monsters living there! the room beside me, there was no reason whatsoever to be feeling nauseous and dizzy here in my home, it was all in my mind. If it was all in my mind on my couch, it was all on my mind on the river. I posted ‘I LOVE WEIRS’ on my Facebook Page, and took myself to bed. Waking at 6am, the day of the race began with a 40k tandem cycle with Kipper from the LauraLynn HQ in Leopardstown to the start of the race at the KClub in Kildare. Oh did I not mention that? – it was another idea of Kipper’s, to add something a little extra to the challenge. If you know Kipper, you’ll recognise that he has a quiet enthusiasm that kind of sweeps you along, before you realise where you’re going! 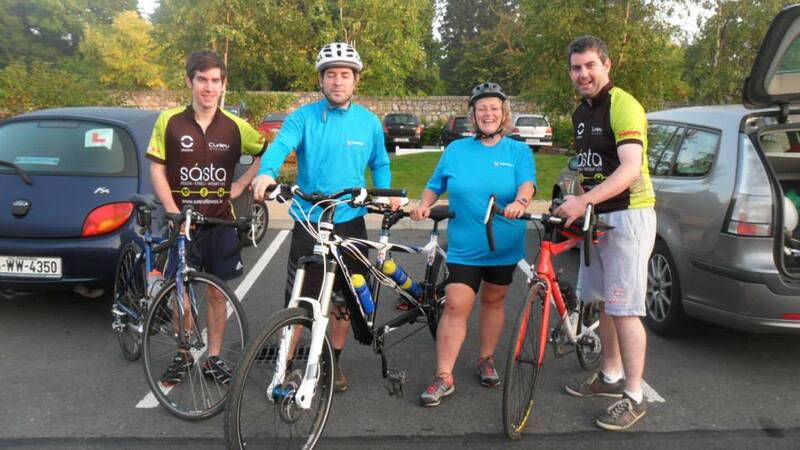 We didn’t mind the extra effort though, we had a great bike from the Cycle SuperStore in Tallaght, and great support from our super SASTA sponsors who helped us raise over €6,000 for LauraLynn. 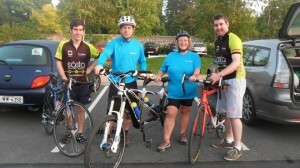 We’re still taking donations, so please pass on the word – you can check that out at www.mycharity.ie/event/weirsnwheels. 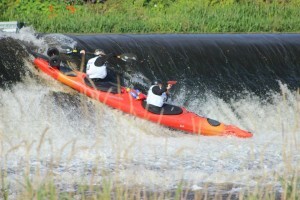 Arriving to the banks of the Liffey at Straffan, my heart was in my mouth, but I kept the mantra going in my head: “I love weirs, I love weirs, I love weirs.” I bumped into lots of paddlers that I’d met and been encouraged by throughout the year, and they were all grins and reassurance. I also bumped into my incredibly brave club-mate Fiona Kelly, who was taking on the weirs solo. She courageously shared her thoughts with me and told me to fight back if I was nervous and attack the water. The thought stuck with me – and there was a special hug for Fiona when we met again hours later on the river bank at the Garda Club to swap war stories. She was amazing and is already starting on her game plan for next year. 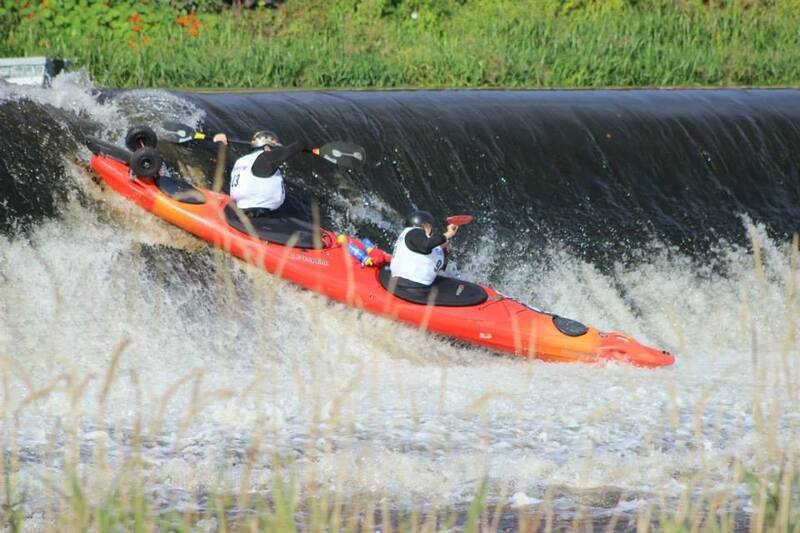 Our Total Experience kayak wobbled precariously as I edged into the front seat just yards from the roar of Straffan Weir. I tried to hide my nervousness as Kipper took his place too and we splashed off into the river and pulled away from the bank. 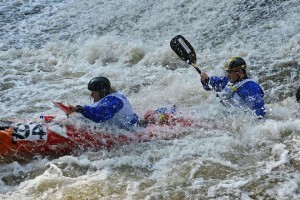 We quickly settled into our stroke, calmly and cleanly cutting through the water as we moved towards the starting line. I concentrated on breathing, and slowing my beating heart. I had come to know and love this river, and the familiar cut and slice of our paddles sweeping through the water was calming and reassuring. I knew the job ahead. I had the most amazing partner to find the line through the weirs and all I had to do was paddle, focus, and do what I’d been doing all year. 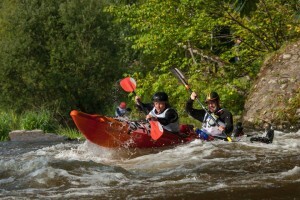 The chatting and banter among the other paddlers was hilarious as we waited for the off, the sun shone and spirits soared and the sick feeling in my stomach eased as I chatted across my paddle to some of the 802 competitors lined up on the river – and finally we were off. We headed towards Straffan Weir, the focal point of so many horror stories I’d been listening to all year. We were smooth and powerful in the water and I felt total confidence in Kipper as he lined us up. I didn’t hesitate, arms high, paddle clean, steady, powerful strokes, no hesitation, we’re at the edge of the world and the river falls away and we’re plunging, through sunshine and rainbows as the river comes back to join us and the wave crashes over us, a quick breath, then mouth closed, and pull, pull, pull… we’re through and still paddling and still upright. Others aren’t so fortunate, there are ditched paddlers in front, swimmers darting out of our way, a rescue kayak sweeps narrowly out of danger – and we’re through. On to the rest. Big memories from Sluice dashing towards the wall on a wave and sweeping through to safety. At the big drop at Lucan, I follow orders and feel the strength of Kipper correcting as we splash down and I feel the kayak twisting and bucking against the river, before Kipper wrestles it back to business and forward, then on to Palmerstown, again Kipper finds the line and down we plunge – clearing the weir I suddenly see the river fall away, a great gaping hole in the water ahead as the current curls madly back towards us in a massive wave – Fiona’s words come back, attack attack attack, paddle in, body forward, bring it on – we’re through, we’re clear… in 3hours 17mins we reached the end, fresh enough to run it all again. As the exhilaration, the adrenaline, the excitement kicks in, I realise…. I love weirs.